Our children learn how to use cell phones, video games, iPads, Kindles and other technological devices by watching us, their parents, so it’s up to us to model healthy habits, find balance with activity and technology and ultimately avoid being so absorbed in our devices that we miss our kids’ bids for attention. We’ve all seen that mom texting, taking selfies and snapchatting at the playground while her three year old is calling out to her “mom, mom, mom look” we’ve also maybe been that parent. We upload a photo on Instagram or Facebook of our kids at the park- in real time, answer texts, answer emails and check our “likes”. The thing is, our kids notice, they’re watching us, watching our phones. 3 Things You Can Do to Change that, Starting Today. Be a role model. Set an example by using tech the way that you want them to use it. Many parents feel they need to be accessible to their jobs. But that’s not realistic, set boundaries for work and family time, keep cell phones away from the dinner table, be fully present with your kids while you’re at the park and turn the TV off when it’s not being watched. Set limits. Establish technology time limits www.healthychildren.org offers a quick easy way to create a personalized family media plan and offers a recommended “media time calculator” based on your children’s ages. Use tech together. Watch, play, and listen with your kids. Sharing your thoughts, opinions and values regarding the content can be great teaching moments. 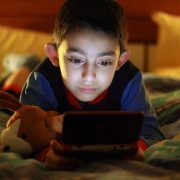 Remember, our children should never feel as though they have to compete with devices for our attention. 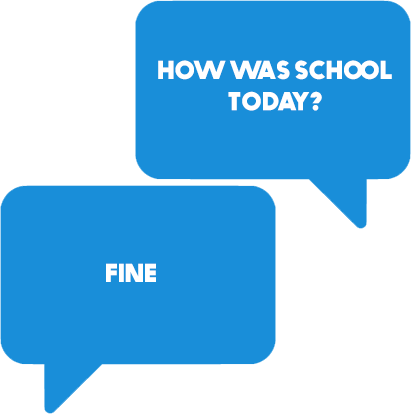 Every parents routinely asked “how was school today?” question rarely gets the response we’re looking for, it’s usually met with “good” or “fine”. So, we try to dig deeper and ask; “what did you do?” yet are still met with a less than enthusiastic “nothing”. Sounds familiar right? It can be challenging to find out what’s happening in our child’s life, but with these ten questions, we can help these conversations be more positive, powerful and ultimately learn more about our kids. Where did you play and who did you play with, at recess? If you could choose, who would you like to sit beside in class? Why? What was the most interesting word your teacher said today? What was your favourite subject today? Why? Is there something you think you’d like to learn more about? Is there anything you feel worried or scared about during school? Were there any times today when you felt disrespected by anyone? Tell me about a conversation you had with one of your friends. What did you like best about your day?